Coloring Without Borders: I have allergies?!? Before coming to Scotland I never would have said I have allergies, or at least nothing significant. On occasion, when we would visit Katie's sister Tracy and her family out in Colorado, I would find myself sneezing a bit, which I figured might be a mild hay allergy; they have a lot of hay for their horses and goats and donkey and miniature horse. Or perhaps some kind of grass allergy. But I would usually have only a one or two instances a day of several sneezes in a row, and then nothing else. Here, I've had a two sizable allergic reactions. For the first several weeks after we arrived I sneezed many, many times a day. When I woke up in the morning, my nose would be stuffed up to the point I could only breathe out of my mouth. My eyes sometimes got red. I had hours during the day during which I was symptom-free, but most days I would get hit with one or more symptoms. We don't have any hay around here, nor any horses or goats or other such animals. I think the source of my symptoms was the grass in our backyard. The landlord (or really, the landlord's agent, since our landlord lives in the Middle East and relies on the agent to handle things) had neglected to cut the grass in our backyard for a couple of months, and so the grass was more than knee-high. It was like a wild grassland in our backyard. Also note that this was the first time in my entire life I had ever hung a load of laundry out to dry. We should be getting a dryer in the next week or two, so look forward to what surely will be an exciting blog post about it. Once the grass got cut -- it took awhile because we had to get the landlord's agent to send out a crew to hack through the backyard (a household lawnmower couldn't get through the stuff) -- my symptoms went away. Not the same day, but within a couple of days. Nowadays I don't have any problems. We keep the grass reasonably short, and I don't seem to have any allergic reactions. Of course, I don't know if it was the grass. It might have been something else. I think we won't know until next year, to see if I get the same symptoms in spring or early summer. My other allergic reaction was this morning. I woke up with a fatly swollen bottom lip, like a horribly botched Botox job. No real pain, but a feeling of tightness and swelling. It subsided a bit during the day, but was still noticeably swollen and tingly. And then it swelled again tonight. Where did this come from? I don't know, but I have three main suspects. 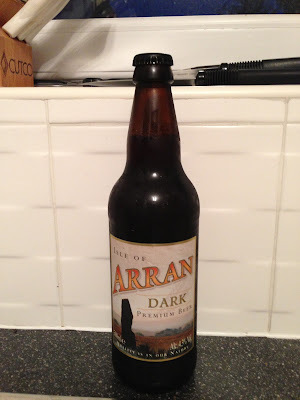 We took a day trip the Isle of Arran this past Thursday, and came home with some foods and drink I've never had before. I ate them last night. First is the Isle of Arran dark brown beer. I refuse to believe this fine beer could have given me a fat lip. I don't think the beer is the culprit. Perhaps it is just my fondness for this beer -- which won a 2012 award for the best dark brown beer in the world -- but I highly doubt I had an allergic reaction to the beer. I've had hundreds and hundreds of different beers, and never had an allergic reaction. I simply cannot accept that beer has given me an allergic reaction. In any case, I plan on continuing to drink this beer (we have 11 more bottles), so we'll see in the not-so-distant future if it's the culprit. The second suspect is a bag of Guinness brand chips (called "crisps" here in the U.K.). I ate those and threw away the bag. Nothing seemed remarkable about them. The third suspect is cheese, probably types of blue cheese. We ate an Isle of Arran cheddar cheese and Isle of Arran blue cheese on Saturday evening. Both tasted very good. I would happily eat them again. I've never had an allergic reaction to any cheese, and I eat cheddar and blue cheese all the time. My guess, though, is that I'm allergic to something in the blue cheese here in Scotland. There must be something among the ingredients, perhaps only trace amounts, to which I'm allergic. I got further confirmation today when eating a roast beef and gorgonzola cheese sandwich. My assumption had been that the allergic reaction was specific to the blue cheese from Arran, but I had a similar swelling after eating the gorgonzola in Crieff today. Did I suddenly develop an allergy to all blue cheeses? Or only certain kinds of blue cheeses? Or only blue cheese from Scotland? Or only certain Scottish blue cheeses which have particular ingredients? I find this sudden reaction very odd. Not sure whether I'll take any formal steps to figure out what is causing my reaction(s). Prior to my swollen lip, nothing has really been dramatic or even all that annoying. I think I'm going to take a wait and see approach. Maybe you are being bitten by some strange Scottish insect while you sleep. Creepy.